This medical doctor has a bit of humor & nostalgia. “Ol’ Doc Leroy” remains one of the artist’s most beloved Street Life characters. Michael Garman commissioned only 1,000 Limited Edition Solid Bronze sculptures to be made. Each solid bronze figure is numbered and includes a numbered and signed certificate of authenticity. Sculpture measures 13″ x 5″ x 6″. ©1970. Solid Bronze. 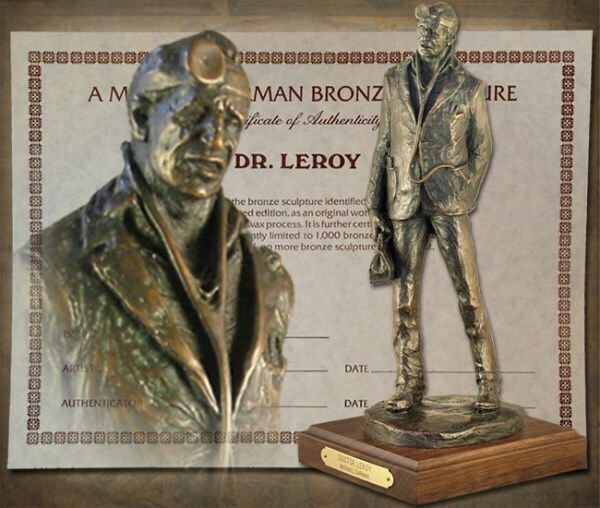 Includes wood base with “Ol’ Doc Leroy” engraved plaque and a numbered and signed certificate.